The holidays are finally over and I know many of us are releasing a sigh of relief. While the holiday season can be fun and exciting, it also creates a stressful atmosphere when you think about all the things you need to do and the added expenses you’ll have. Now that it’s a brand new year, you’ll need to pull back the rug and find out how much money you actually spent during these past few weeks. Found out you went over budget and those last-minute expenses got to you? No worries. 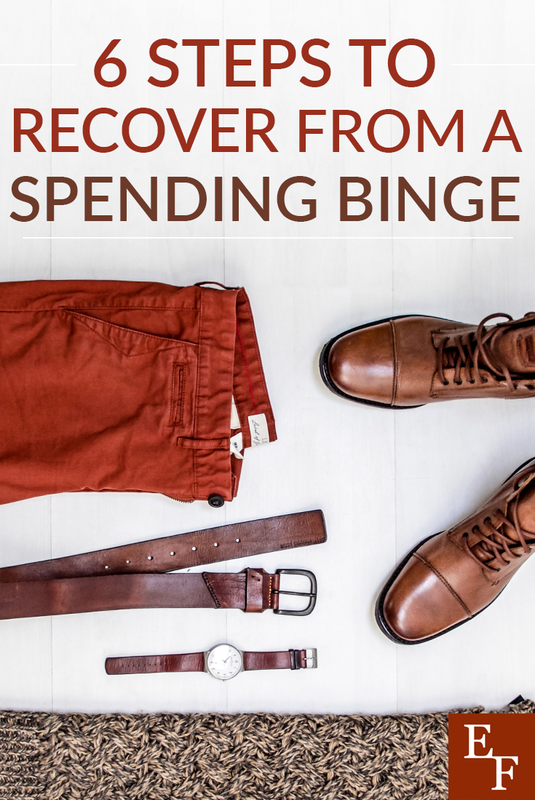 These 6 steps will help you gracefully recover from your spending binge and get back on track with your financial goals. The first step is to assess the fact that overspent and forgive yourself for it. You won’t make any progress by continually beating yourself up and regretting your decisions. It happens, more often than people like to admit, but it’s not the end of the world. The sooner you shift your mindset from self-pity to figuring out what you need to do in order to bounce back, you’ll recover your finances much quicker. This should be a given, but you want to stop spending extra money and track your spending from the past few weeks so you can know exactly where you stand. Nothing makes me more nervous than taking out my debit card without really knowing whether or not I can afford to make a purchase. Don’t let this happen to you. Peel back the band-aid and assess the damage. Then, go on a spending freeze while you develop a plan for recovery. Stop spending money on unnecessary purchases entirely and take all your credit cards out of your wallet. You may even want to stick to a cash budget for a week or so and use the envelope system to account for approved expenses like fuel, utility bills, and your housing payment. Next, comb through some of your purchases and see if you can return anything or perhaps sell it if you’re having second thoughts. Most stores will allow you to return purchased items within a specified time frame with the original receipt. If you no longer have the receipt, you still might be able to exchange it for store credit or a gift card. This would be a valid option if the store sells general items you need to buy regularly like Target or Walmart. If not, you might want to pass on the credit or pass it on to someone else if it will just tempt you to overspend again. If you absolutely can’t return the item to the store, consider selling it online or on the Facebook Marketplace to gain the money back. During your spending freeze, you’ll be able to cut down on your spending tremendously and adopt better habits. Focus on setting a clear and realistic budget, cooking and eating more meals at home, avoiding impulse buys when you’re out at the store, canceling unused subscriptions, and finding free and cheap entertainment. To help you cancel your subscriptions, try using the free app Trim. You can also consider negotiating a better rate with your insurance companies. After your spending freeze is over, continue to approach your finances with that same mindset and understand that you can probably get by without spending as much money as you have been. I recommend going through your budget line by line and questioning whether you should keep or reduce each expense. This can help you free up more money to tackle any credit card or personal loan debt you may have incurred. Earning some extra money right after a spending binge will make you feel better and help your wallet out quite a bit. Sometimes, when we dig ourselves into a deep financial hole, extra income can be crucial to allow us to get back on track. See if you can pick up extra hours at your job, ramp up your current side hustle, or get a temporary part-time job. Also, try earning money online by offering freelance services, testing out websites, taking surveys with Survey Junkie, tutoring, or selling items from your home. If you have a car, you can also drive with Uber, or deliver meals with Uber Eats. One of my favorite ways to make extra money fast is by freelancing because it’s flexible and there are always work opportunities. If you can write, edit, design, do virtual assistant tasks, etc., you can check out sites like Upwork.com or PeoplePerHour.com so you can set your own rates and bid on projects that will pay quickly. Finally, you need to set yourself up for success in the future as well so you won’t have to experience the negative effects of a spending binge again. One of the best ways to combat overspending is by establishing a checking account buffer which is basically extra money that sits in your account in case you go over budget. We all overspend from time to time because no one is perfect. This is why having a checking account buffer can help keep your account from going negative as well as stop you from charging extra expenses on a credit card. Once you get your finances back on track after overspending, start throwing extra money toward your checking account buffer so you can utilize it in the future. Make it automatic and track your savings. Try to have at least one weeks’ pay sitting in your checking account at all times and if you have a fluctuating income, consider having two weeks’ pay just to be safe. If and when you happen to spend some of the money, be sure to replace it regularly. Have you ever went on a spending binge? How did you recover?